“The inaudible noise from wind turbines” is a very interesting study of the German Federal Institute for Geosciences and Natural Resources (BGR), headquartered in Hanover. It examines how infrasound from wind turbines may disrupt sensitive stations. The BGR operates inter alia the infrasound station I27DE in the Bavarian Forest, which is part of the International Monitoring System (IMS) to monitor compliance with the Nuclear Test Ban Treaty. With a series of measurements, the Institute wanted to clarify what distance wind turbines should have in order not to disturb the infrasound monitoring system therefore. As a by-product, the scientists developed models of required distances from wind turbines to residential areas. Is the meter more sensitive than a person? Infrasound monitoring systems operate with modern micro barometric pressure sensors, the sound waves below a frequency of 8 hertz (Hz) over long distances can detect. Typical sound level meters are working, despite high-quality class-1 microphones only inaccurate in this frequency range. 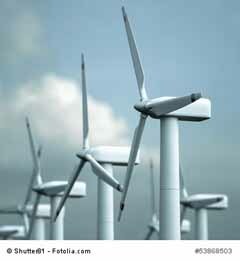 Wind turbines produce according to the study of the BGR maximum sound level of 110 dB. In the frequency range below 10 Hz, these levels are not perceptible with normal hearing. The question is, why people again and again report health problems in the vicinity of wind turbines. The infrasound study by the German Federal Environment Agency of July 2014 refers to research terms, the report of mood disorders of the subjects in sound events below threshold: pressure on the ears, dizziness, concentration problems, cardiovascular problems or general discomfort. In the laboratory studies, the subjects responded to different degrees, suggesting a very individual perception. The generally accepted formula, “inaudible is imperceptible”, can no longer maintain current level of knowledge. Wind turbines produce neither uniform nor omnidirectional sound waves. Depending on the speed of rotation of the rotors arise pulsed waves of about 1 Hz to 1.5 Hz. Moreover, the sound waves are directed. In a certain range of the radiation angle higher sound level shall be recorded. Few degrees away from the angle the sound level is lower. At what distance to station the wind turbine should be? The goal of seismologists is a trouble-free detection of infrasonic sound levels produced worldwide. Based on readings from the wind turbine near Hannover and the addition of further computational models starts from a minimum distance of 20 kilometers around the IMS station. From this distance the sound events of wind turbines dive under the general noise of less than 50 DB. For a distance control to residential areas, but this guideline is not intended to apply. Here the researchers of the BGR assume that man can no longer hear a sound event one kilometer away. Is not that a paradox? The technical equipment enjoys a higher status than man. A parallel to the electromagnetic compatibility (EMC) opens up: in these rules shall apply to machinery lower limits than for the working people. This entry was posted in environment and tagged ims-station, infra sound, wind turbines on 2014/09/21 by joachim-w.